Last week, I was sent on assignment to teach at a local junior high school and let me just say...the Japanese educational system never ceases to amaze me. -Kids all wear their P.E uniforms in class. Which, first off, just looks comfy and makes me questions why I don't get to dress like this every day. The blue tracksuit is so cute an honestly very in style now too. -Japanese high schools are tall buildings. The first year classes we taught were all on the 4th floor...and nobody uses an elevator or escalator. That means walking up 4 sets of stairs every time they have to go to their classroom. I was out of breath after doing that once...which made me realize why they're all fit! -Before every single period, the class leader will do a proper 挨拶 (greeting) and then yell "黙想" (Mokuso) and on that command, every student closes their eyes and sits there silently for 15-20 seconds...meditating and being silent before class. WHAT!!? The first time I witnessed this I was in disbelief. They start off every class meditating and gathering their thoughts to have a positive attitude. Wow. 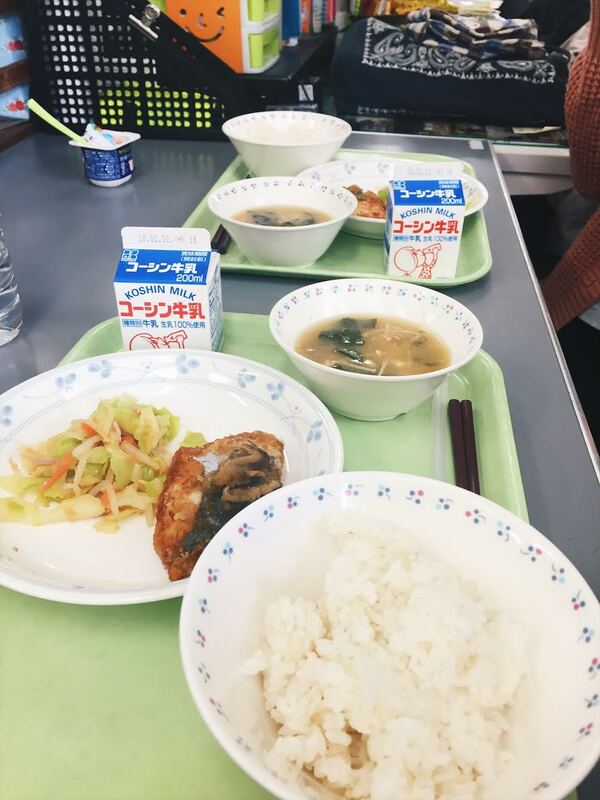 - 給食 (kyushoku) "school lunch"... every Elementary School and Junior High School in Japan serves school lunch. It's an incredible thing. Every day has a different (perfectly) balanced meal. Some protein, a lot of veggies, soup, a little snack of dessert, and milk. always. The teachers all participate in this lunch time tradition too...they all grab their tray and eat it in the office together. After everyone is done, they put their dishes back properly on the cart to be wheeled back to the kitchen and everyone proceeds with their day. I always love Kyushoku because it is truly the quintessential Japanese childhood meal. -In every class I taught...almost every kid was wearing a face mask. The teachers strongly encourage this as a way to prevent the spread of the flu. Face masks really represent, to me, how one thing can be completely natural in one culture...and completely foreign in another. Because if a junior high school kid was to wear a face mask in class in America, people would absolutely freak out and think the were on the verge of death. Yet here in Japan it is as normal as eating a peanut butter and jelly sandwich in the states!! (weird for Japanese people).